Today's stage saw the withdrawal of one rider, Xabier Zandio, a Spaniard on the Caisse d'Epargne team. He was in 178th position in the General Classification. This reduces the peleton to a total of 186 riders. Again, many of these are riders like Dave Zabriskie who was undoubtably worn out after taking several big turns on the front of the peleton chasing down the breakaway, in support of their team leaders. Zandio and Di Gregorio were both involved in a crash at about 62 km on the course today, which forced Zandio to abandon from a fractured collarbone. 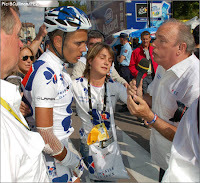 It took nearly 20 km for Di Gregorio to chase back to the peleton, with the aid of his teammate Lilian Jégou, but he still required treatments from the Tour doctor for an injured elbow at about 95 km. It was reported he was so injured that he needed help from a teammate with his musette bad in the feed zone, and he was struggling as he dropped off the back of the field with about 15 km to go to the finish line. In other Lanterne Rouge press, there's a somewhat snarky piece at Bicycling.com that refers to the Lanterne Rouge as "first worst". That's certainly not what I would call some of the hardest-working, least-recognized riders in the peleton, but YMMV. Update: Lanterne Rouge Rémy Di Gregorio has broken a bone in his arm which will require surgery, so he will be a DNS for Stage 5. We wish him a speedy recovery and a quick return to form. That will bring the number of riders down to no more than 185 in tomorrow's start.